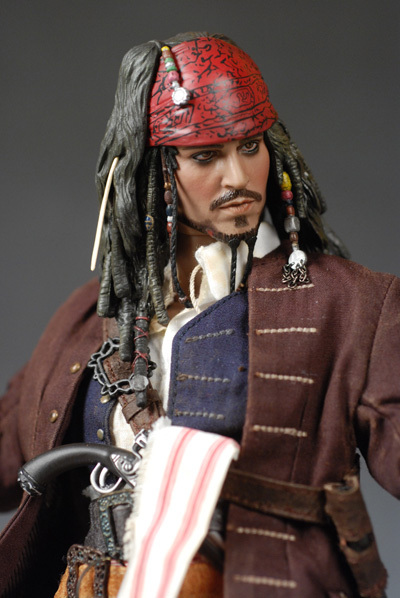 There have certainly been no shortage of collectibles, replicas and toys based on the Pirates of the Caribbean movies. If you ignore everything else and only focus on action figures, we've still gotten product from Disney, NECA, Zizzle, Medicom and now Hot Toys. For the most part though, there's been clear distinctions between the product. 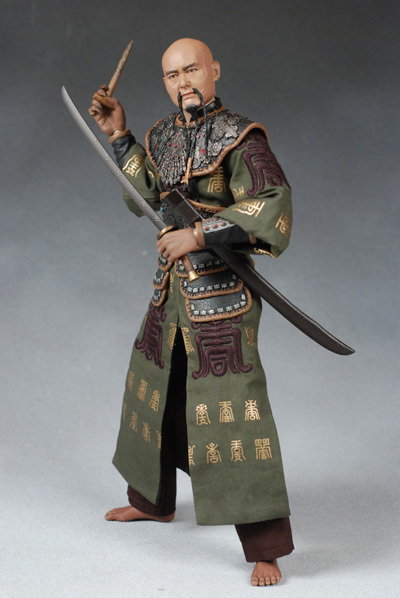 NECA was sticking with the 7" scale (predominately) with little articulation. Disney did a similar scale, but went with more articulation, and a more toy focus. Zizzle had the 3 3/4" scale, with more articulation and directed toward kids. Zizzle also had a few 12" figures, but again, they were designed cheap and mass market. Medicom was the 12" high end market, directed towards the adult collectors. 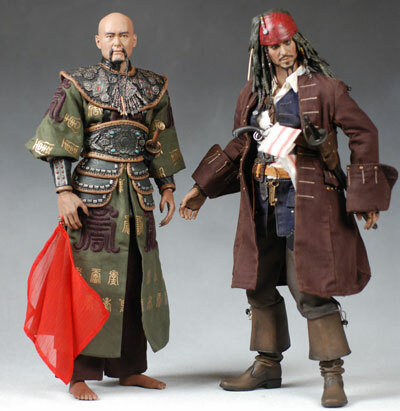 Ah, but now Hot Toys has stepped into that high end 12" market as well, and they've done it in grand style, releasing Jack Sparrow and Sao Feng right out of the gate, with Elizabeth Swann scheduled for the near future. These guys aren't cheap though, with the current price tag running around $150 a piece. I snagged mine early though, when you could pre-order them for less than $100 each. If you're thinking about getting Ms. Swann, I'd pre-order now, rather than waiting until she's released. Once stores have these in hand, the price tends to rise. Generally, Hot Toys does a nice job with packaging, but there were a few issues this time around. The boxes are standard fifth panel flap style boxes, but they are inside a shiny sleeve. The film graphics used on the sleeve are quite attractive, but I was generally unimpressed with the actual toy photos this time around. There also is only a limited amount of text, even with lots of package real estate. The figure and accessories sit inside a thin plastic tray with not one but TWO clear plastic covers. Even with this 'double baggin', they used tape to hold some of the accessories in place. Even more annoying, there are six twisty ties on each figure, holding it down in the tray! This tends to wrinkle the uniform and create lines where the twisties are tightly constricted across the material, and is generally unnecessary considering the use of two covers. There's been some debate around the Jack sculpt. Just how much he looks like the Depp as Sparrow is up for debate, but I will admit that it does depend a bit on the angle you look at him from. The face seems a *little* fatter in the cheeks, but the eyes, nose and lips are awfully close. 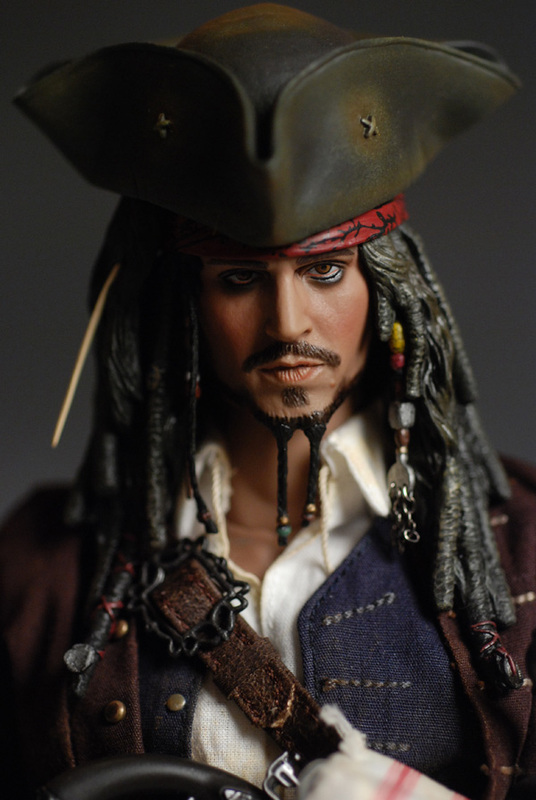 What really takes this sculpt to the next level is how much it looks like an actual human, whether it's Depp or a Jack Sparrow impersonator. The hand sculpts look amazing, including the sculpted wrist bands up on his right arm. 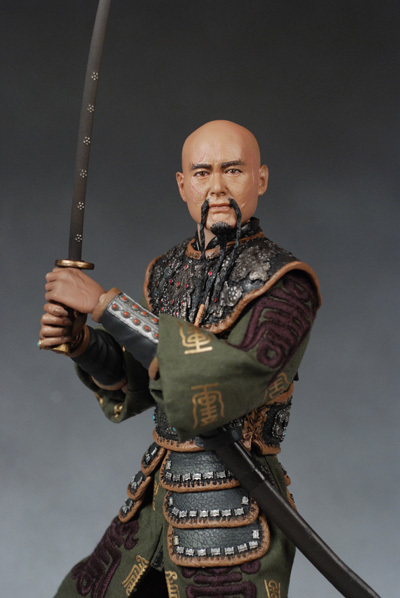 The boot sculpt is extremely realistic, and the detail work in the hair (both on his head and on his face) is great. There's some other aspects of the sculpt that are worth noting. First, the hair is sculpted from a softer, more rubbery material, which allows for much more poseability. Even though it's made from a softer material, there's still plenty of detail. There's also some terrific small details like the real metal tiny chain links running off the disk in his hair on the left side. This is the kind of work that looks tremendously realistic in the right light and from the right angle. Sao isn't quite as good, although he's still well above average. They've done a nice job with a skin texturing, and adding in the sculpted scars. The hands have long fingers with even longer nails, and the likeness to the actual character might be even stronger than the Jack sculpt. Still, there's something that's a bit off to me. Perhaps the head is a smidge big, even with the clothing on. Perhaps it's the slightly too round look to the head, even when Sao was pretty round in this film. There's something there bugging me, even if I can't quite put my finger on it. Most likely it's the angle of his beard, which tilts back in toward his body a bit rather than coming down straight. Still, he's damn near perfect, and well worth the 3 1/2 star score. These are on the large size, running around 12 1/2" tall. They actually fit in pretty good with the Sideshow line, although they may be a bit big to go with even other Hot Toys figures, and are certainly bigger than Medicom figures. If you want a great sculpt to really stand out, it requires a really great paint job. I think that the paint work on Jack is what actually takes it to this level. He has the usual eye makeup, and some wonderful small paint detail work on the baubles and beads in his hair. The softer material they've used for the skin seems to work well with the paint, giving him a slight texture to his skin and a very realistic variation in tone. Some folks have thought he's a little too dark, but I don't think that's true. It may be due to the conditions of some photos, but in person the skin tone looks great. 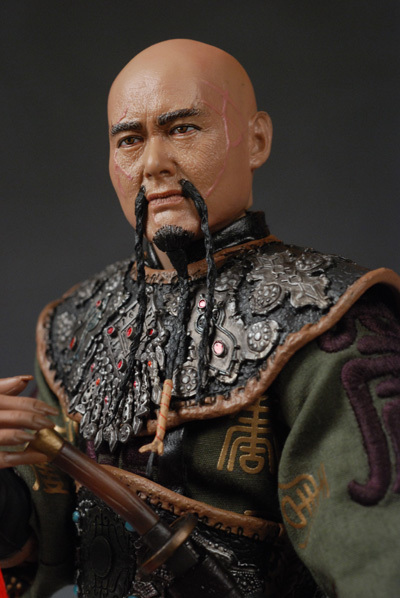 The paint detailing on the lips, eyes and beard is top notch, with perfect cuts and extremely realistic colors. I couldn't find a single thing wrong with the paint work on this entire figure. Some folks may find the way the eyes are painted - with the pupils looking out through the upper lids of the eyes - difficult to get used to, but the look works really well with the head tilted down. Sao has an outstanding paint application as well, but he does have some issues around the color used on his hands and feet. They are much darker (dirtier?) than his face, throwing off the look a bit for me. Hot Toys always have well articulated bodies, but depending on the character design, how much articulation there is and how well it works can vary. Jack has a ball jointed neck that works extremely well, even with the long hair. That's because they used a soft rubber for the hair, which allows you to move it either in front or back of the shoulders, turning and tilting the head as appropriate. 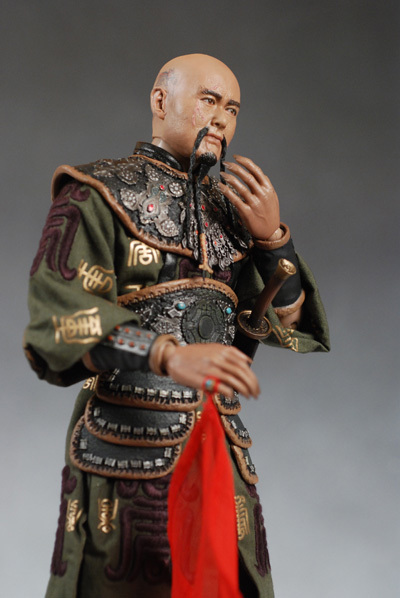 He has all the excellent articulation from his neck to his knees including ball jointed hips and shoulders, double jointed elbows and knees, and cuts all around. The hips, waist and chest work extremely well together too, allowing the figure to take some very realistic poses. Generally, the Hot Toys body (like the Medicom) does a nice job of 'hanging' naturally. Jack does lack a couple joints though that you might expect. The swappable right hands both run all the way up to the end of his wrist bands, which means that the right hand can turn, but can't move in any other direction. That's a pretty big loss for this particular character. I know they did it for the appearance of the sculpt, but it still ends up an Articulation negative. The other problem is at the ankles. The boots are an amazing sculpt, but are one solid (and fairly hard) hunk of plastic. That means no ankle movement at all, and I found it difficult to get his legs in any sort of deep stances because of it. Still, he poses better than most 12" figures out there, and in a very natural way. Oddly enough, Sao did not. Considering that his costume is a fairly loose design, it was very surprising that I had a tough time getting him to even stay standing. The ankle joints (which I just whined about not existing on Jack) are too loose, and in fact, the left foot tends to fall right out. Even ignoring the ankles, the body simply didn't hang and pose as well as I expect with a Hot Toys figure. I also wanted to mention that the ball jointed neck works well, but it means that you can put a lot of pressure and even damage on the center hunk of hair hanging down from his beard. Be careful when moving his head around, so that you don't rub the beard across the armor too much. Both figures come with quite a few accessories, but Jack has an excellent assortment. He starts out with his sword and scabbard, which fit inside the special shoulder belt quite well. The sword is a little thin, but the lightweight nature means it will allow for some good poses. He also has several items that are intended to attach to his belt. 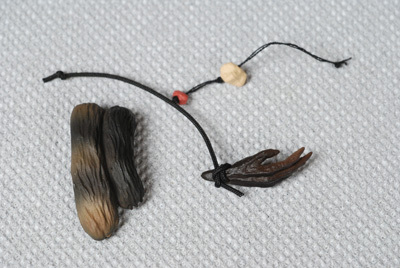 There's a couple sculpted (together) pelts that hang over the belt, the monkey's paw which ties to the belt, the compass that ties to the belt, and a small bone and rock on a string that can also be attached. All three of these are on thin strings which I had to tie myself to attach them. If you have big fingers it's a tough task, but it does allow you some flexibility in length and position, and doesn't require you to remove the tight belts to attach them. 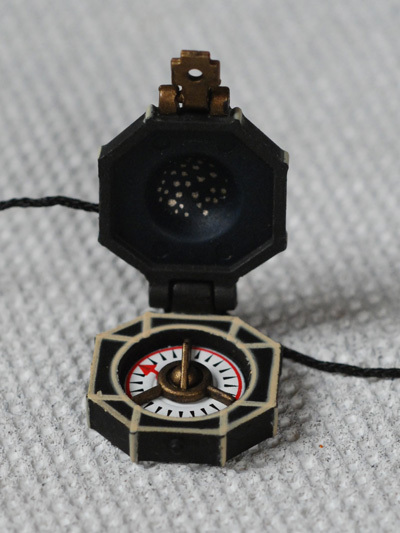 The compass is very cool. It's very small and delicate, so I was very surprised to find that it opened. There's even a small latch that holds it closed! 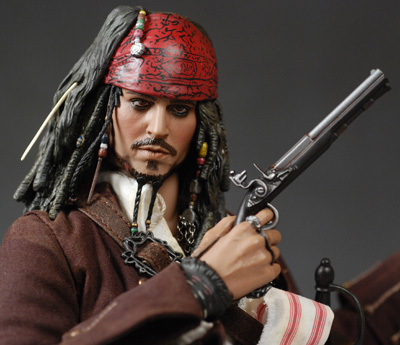 Jack also has a very, very nicely sculpted and painted flintlock, which is done in a reasonably good scale. 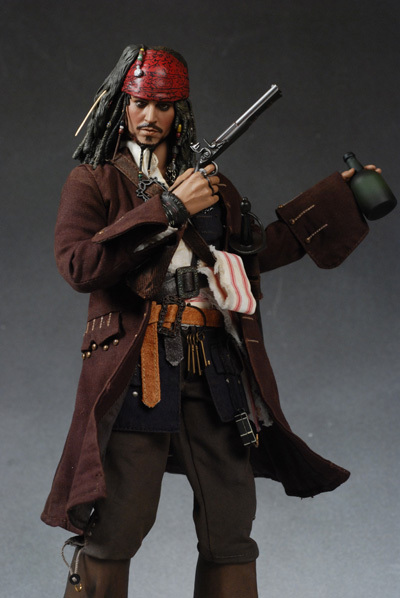 Jack also comes with an extra right hand sculpted to hold the flintlock. There's a set of skeleton keys too, and these have a metal ring. This ring opens quite easily so that you can attach it to his belt without removing it. That's key, since the belt is on so tightly and cleanly right out of the box. Most of us aren't going to want to remove it. Finally, what pirate would be complete without his bottle of rum? Certainly not Jack! That's quite a number of very well done accessories, even at this price point. Sao has a fair share of goodies too, though not *quite* as much as Jack. He also has his trademark sword and scabbard, but these don't fit in his 'loop' quite as well. In fact, the loop is very tight, and made from a hard plastic, so that damaging it is actually a very real possibility. The sword is great though, with a nicely sculpted design right on the blade. 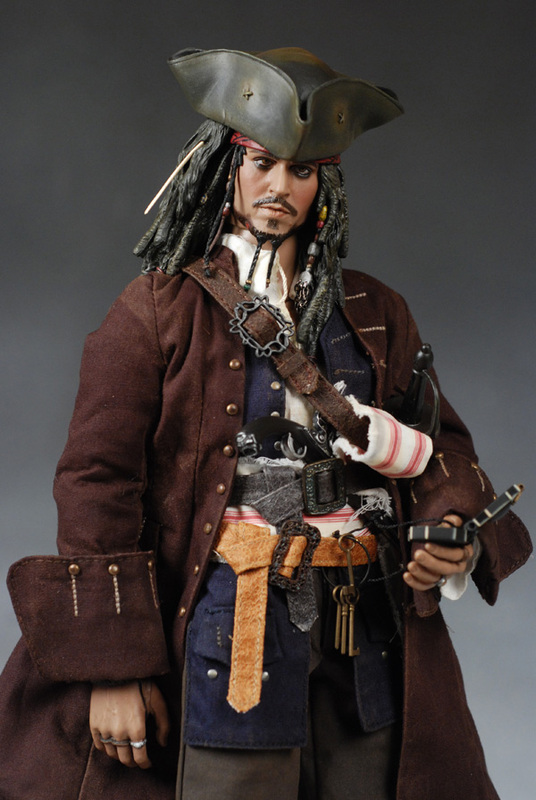 He comes with a flintlock too, and not just a re-used version of Jack's. It's not quite as cool looking, but it's nice to get two versions. His final weapon accessory is the specialized boating 'awl' with the handle and sharp point. The scale is pretty good, although it does seem a smidge small. He has not one but two swappable hands, designed to hold the accessories. Unfortunately, none of the hands do that particularly well. The weapons are all a sloppy fit, and the sword is particularly difficult for him to hold, even in the specially sculpted hand. Both figures come with a display stand, which is pretty much standard these days. However, this pair is a little different, because they've added a small plaque on the top of the base at an angle that has the name of the character on it. Generally, I'm not a huge fan of name plates, since it should be fairly obvious to anyone who the character is. But these do look pretty nice, and give an interesting look to the base. Both outfits are stupendous, but Jack's edges out Sao's once again. Sao has his under clothes, along with his very well done robe. 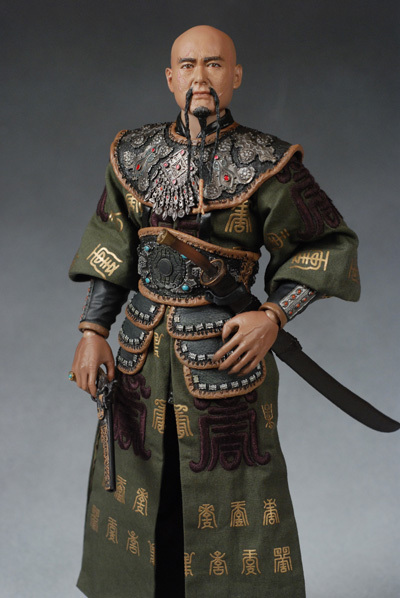 The armor is sculpted rubbery plastic, and holds detail extremely well. Some of it is removable (like the gauntlets) if you're so inclined. In fact, you should be able to complete undress him if you decide to spend the time. The robe is outstanding, with the larger symbols embroidered on the outfit. The fit on the overall outfit is also excellent, and the quality of the material and stitching is top notch. In fact, the outfit might be a little too tight. There's a very thin velcro used to close the front, and I found that to even attempt any deeper stances (which generally didn't work all that well due to the earlier discussed articulation issues) the front had to be opened up a bit. 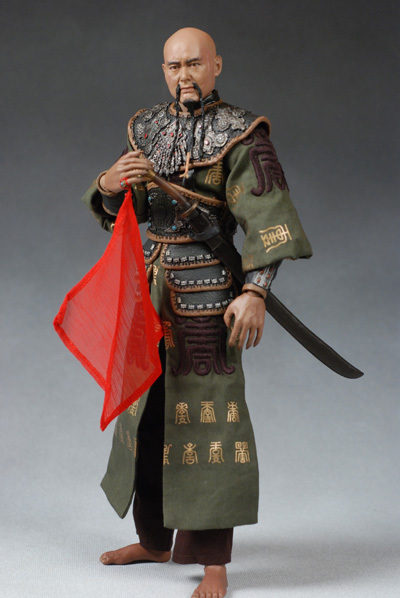 I'm going to count Sao's red hankie as part of his outfit, although I suppose you could call it an accessory as well. It can be removed from his hand, but I wouldn't recommend it. It's a bit large, certainly larger than what was in the film, but it's a nice inclusion nonetheless. Jack has a very detailed costume, from his hat to his sculpted boots. Everything is done in very high quality material, and the tailoring is stupendous. Every layer fits well and appears to be completely in scale, even though there are multiple layers. Even with the shirt, vest and jacket, he doesn't appear too poofy or fat. There are two belts as well, made from slightly different materials and different colors. The buckles look excellent, and the figure comes with these belts synched quite tightly. Usually a figure really requires a redress to look decent, but Jack comes right out of the box looking terrific. The white sash was a little annoying - you can see in the photos that it wanted to pop up on me, and I will have to iron it eventually to get it to hang the way I want - but it has a nice weathering to it and does look good if you futz with it long enough. I mentioned the hat earlier, and I actually like the figure better without it. But if you position it just right, you can make it look pretty good. The trick is to try to get it as far down on his forehead as possible, just like in the actual photo of Jack on the cover. Finally, there's the coat. While I already mentioned the great fit, excellent material and top quality stitching, there's also a wire that runs along the bottom edge! With this wire, you can get the jacket itself into some excellent poses. These aren't exactly toys, and they aren't really built to be played with. You have to take some care even posing them, so the Fun Factor is clearly not high. They look great on the shelf once you get them where you want them though, and since I don't expect something like this to be too 'fun', it doesn't effect my personal Overall. I ordered early, and paid $95 each for these. That's a decent price, and I feel that Jack is definitely a $100 figure. He's not an amazing bargain, but if you understand my rating system around value, you know that a score of **1/2 means 'average', and it won't hurt his Overall assessment. Sao isn't quite as good. He's great in some areas, but with the issues around articulation and to some degree paint, I just can't say he's really worth the extra $25 or $30 over a high end Sideshow figure, for example. Now, finding these around $100 is going to be a trick now, and at the more likely price of $125 - $150, you can drop a half star off each one. These are high end collectibles - that tends to translate into "don't toss them around". The various small parts on Jack can be damaged, like the belts or thin cords. Don't put too much pressure on any of the smaller items to avoid breaking things. The good news is that there isn't anything here that is MORE fragile than you'd expect if you've bought figures like this in the past. Sao has a couple problems though that are unusual. First, that center chunk of hair on his beard is going to get damaged or broken over time if you rub it against the armor repeatedly. Keep it in mind, since it's tough to avoid. Also, that loop for the sword is likely to pop off (mine did) and might even break if you're not extremely careful. If Hot Toys continues to produce figures at this level of quality, they'll be getting a ton of my money. I ended up buying a Rambo when I was at SDCC, and after seeing the Rocky figures, I'll probably end up breaking down and getting a couple of those as well! The quality rivals any other sixth scale company out there, at any cost, and yet runs in a middle range between Sideshow and Medicom in cost. 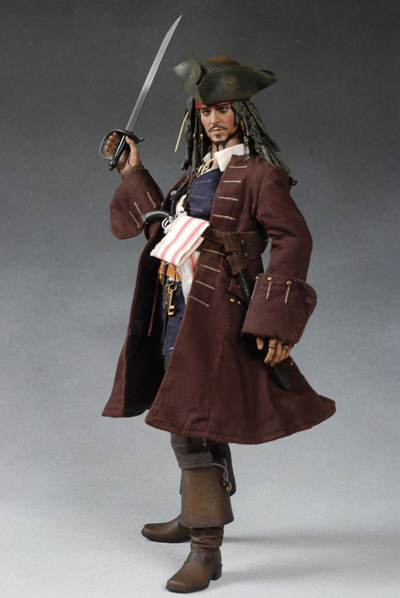 Jack is already one of my favorite figures of the year, and I'm certainly looking forward to their pirate Elizabeth Swann! - Alter Ego Comics has either for $121.49. - Dark Shadow Collectibles his a pre-order price of $121.50, and Elizabeth is at $112.50. - Amazing Toyz is also at $122, and $112.50 for Ms. Swann. Do you see a trend? - CornerStoreComics has the pre-order at $122 as well, and Elizabeth is again at $112.50. 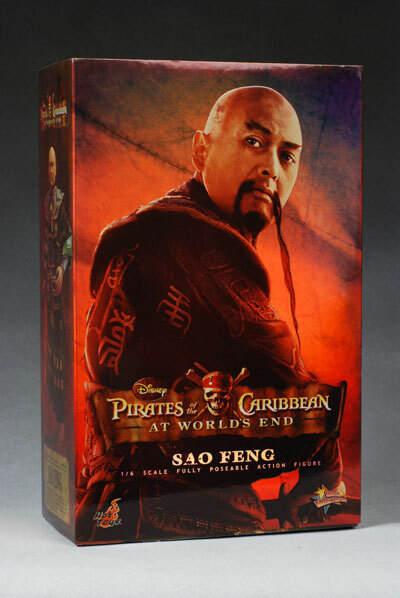 - the last POTC review covered the 7" Sao Feng. - not too long ago, I reviewed the series 2 figures from NECA, and the Clanker from the newest series. 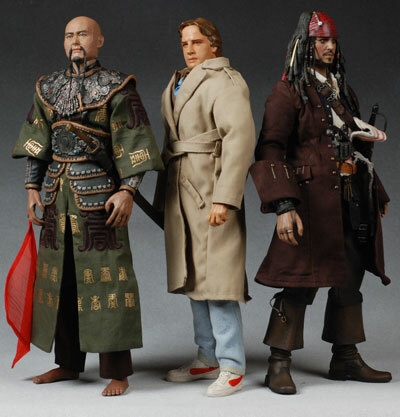 - then there's the 12" Sao Feng and Jack Sparrow from Zizzle, and had a guest review of the Will Turner. - I reviewed the new cursed boxed set of Jack and Barbossa. 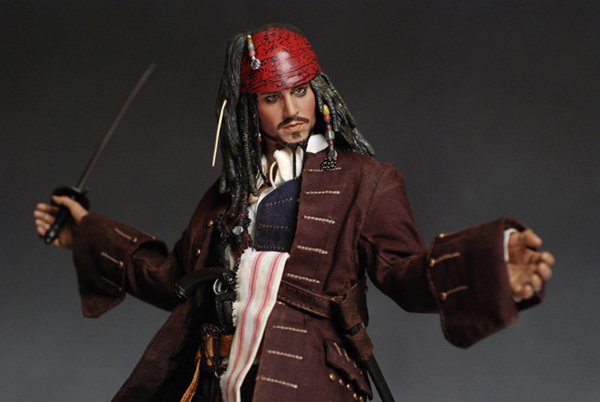 - Zizzle's line of 3 3/4" has gotten a review of some of the figures, along with a guest review of the Isla Cruces set, and the Pirate Fleet vehicles. - Disney released some figures based on the actual park attraction, and not the film. 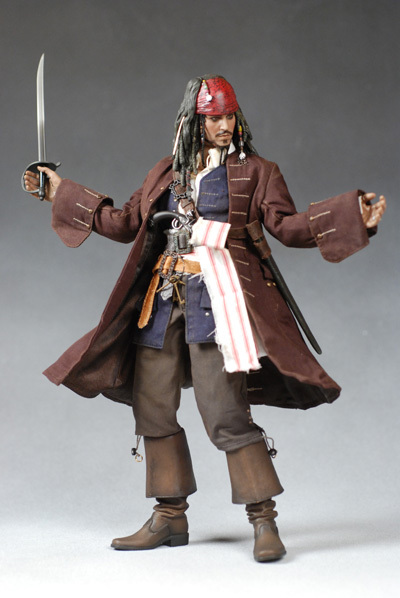 - Disney also has their own set of POTC figures out now at their stores, including Jack and Davy of course, and a second series with Jack, Barbosa and Davy.